AddressThe address for this sale in Wyoming, PA 18644 will no longer be shown since it has already ended. This sale in Wyoming, PA 18644 is a "By Appointment" sale. Please see sale info below for details. Cash strongly preferred but will accept credit cards in special cases. Bring Help to Load Large Items, Not Responsible for Accidents. Free packaging supplies available while supplies last. 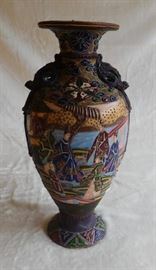 Antique EWER with Asian and Arabic Influence 16 inches high X 5.50 inches wide. Flintlock Gun, 20 in long (Needs repair). North African Flintlock pistol, 2nd Half of 18th century. Turkish Miguelet Pistol, late 18th Century Cavalry Style. This is one of three flintlocks being sold. Four small Schnauzers, Pewter (? ), Figures stamped on bottom GERMANY. Approximately 3 to 4 inches long and 2 inches wide. 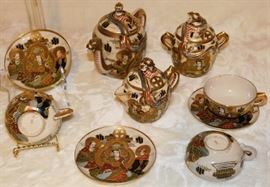 German Set of DESSERT Dinnerware Königl.pr.Tettau - Circa 1960s This would have been a complete set for 12 but it is missing one tea cup so it is a complete for 11 plus extra pieces. PORCELAIN VASE 1000 SILVER OVERLAY GERMANY - SPAHR meaning pure silver, 4-1/2 inches high X 4 inches wide X 2 3/4 inches wide at mouth. 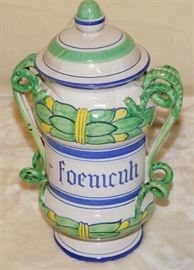 ITALY 1723, Antique Italian Majolica Candlestick holder, 7 " high X 3 1/2 " at base. 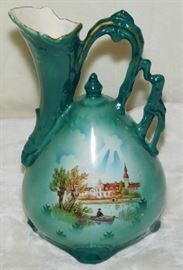 Green Water Pitcher, Vase, Ewer, with a Man in a boat Landscape, Made in Czechosolvakia. Stamped G. Silver, Hand Mirror with woman portrait painted on the back, 9.25 inches Long. Stamped Underglaze, Royal Bavarian China (plate with heavy gold) Hutschenreuther, Selb, Bavaria. 11 inches wide. Decorative plate, Hand painted dogs, Signed R. K. BECK, Circa 1862, 12 inches wide. Ceramic Will Herrera Mask. 1970s, Signed Will Herrera Stamped - Cast of Thousands. 13 inches Long X 7 inches Wide at the widest point. Porcelain claw footed bowl with lid. Angels/cherubs, animal faces/goat heads?/and human faces?, garlands of green leaves with red & yellow flowers. Stamped underglaze, Italy, 339/305. 5 1/2 inches High X 8 inches at the Widest Point. Antique, Rare, Silver Luster Water Jar or Vase. Teal with Silver Luster Flowers, and Silver Luster handle. 10 inches high X 5 1/2 inches at widest point. 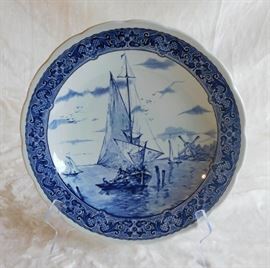 Large Antique Persia Waws Picture PLATTER. 15.75 inches long X 12.25 in wide. Porcelain Mans Bust. Initials J & TB (James and Thomas Bevington). Circa 1863-1876. 6.5 inches high X 4.5 inches at widest point. 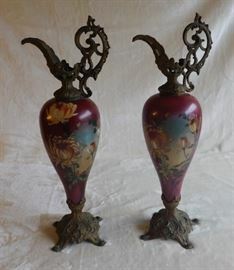 Pair of Antique Silver or Silverplate Candlesticks covered with a dull gold tarnish patina or paint. Each base is Stamped SOLID ENGLISH. Each candlestick comes apart. 9 1/2 inches high. Base is 3.25 inches per side. Antique Asian Wooden Jewelry Box which top flips up into a mirror. It has two drawers in the front. Hand painted on top and sides. It has a brass handles on each side. 6.5 inches high when closed and 14 inches high when opened, 12 inches long, 9 inches wide. Set of six knives in the box. 1865 The Wm Rogers Mfg. Co. Solid Steel Handle, Silver triple plate, Hartford Conn.. Knives are 9.25 inches Long. Silverplate Centerpiece, fruit stand with handle. Six sides are full of wild animal scenes. It is engraved underneath: Meridian Silver Plate Co., 1620. It is 15.5 inches high X 11 inches at widest point. Antique Solid Heavy Brass, two arms, three footed candelabra. Tiny engraving on bottom underneath the tar/dirt reads: ENGLAND. Everything pulls apart. Approx 10 pieces. Probably 18th Century. Unsure. 6.75 inches at base. 21 inches high X 11.25 inches arm-span. White Milk Glass, Rose Water, Perfume Bottle. Embossed picture of a LAMB/DOG/HUMAN. 9.5 inches high X 5.50 inches at widest point. Naked Woman, Porcelain Figurine. On the bottom it is stamped underglaze: HOLLOHAZA KEZZEL FESTETT. 11.75 inches high X 5.25 in at widest point. Porcelain Blue Jacket Soldier with sword in right hand, riding on a horse. Stamped green tree in green ink underglaze: HOLLOHAZA - HUNGARY - 4834 10.5 inches high X 7.5 inches at widest point. Limoges, France, Plate Stamped: La Dame a la Licorne, Robert Haviland and C. Parlon, 1979 Edition, Limitee No 3, 9.75 inches wide. Small Porcelain Bud Vase with handles. Two women in love. Circa 1890 - 1918. Austria. 4.6 inches high X 2.75 inches diameter. Cast Iron Toy and/or Paper Weight of Olive Oyl, Popeye's wife or girlfriend from the Cartoon Series. She is made of Cast Iron & Hand Painted. Originally made by Hubley, this one is not signed. Circa: 1950's, 4.5 inches high X 1.5 inches at widest point. Set of 2 Porcelain, Asian, Male & Female figurines in a sitting down position. Some paint loss. Sold as a Set Only. 12 inches high X 5 inches at widest point. Pair of Vintage Toby Mug Faces, Salt & Pepper Shakers. 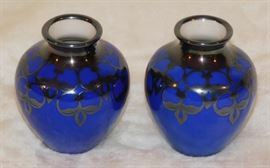 Stamped on bottom: Made In Japan - 1.75 inches high X 2.5 inches at widest point. MOSER BOHEMIAN ART NOUVEAU ORIENTALIST EMMERALD GLASS GILT DECANTER/BOWL & COVER WITH APPLIED SMALL RED STONES. 12.6 inchest X 7.5 inches at widest point. Nipon Vase with Embossed Painted flowers. No mark, it faded away. 7.6 inches high X 7 inches at widest point. Serving Platter with matching dip cup. Sterling Silver Overlay. Plate: 13.25 inches in diameter. Bowl: 3 inches high X 4.75 inches in diameter. Pablo Picasso and Salvator Dali posters. Mid-Century Modern Lamp, one of several. Original oil painting on canvas signed by Nikolay Kurshev, born in Cheboksary, Russia in 1950. Frame measures 15 inches high X 18.5 inches long X 2.5 inches deep. Antique 6 Part Oak Globe Wernicke Sectional Bookcase. Antique William Shakespear books in German, volumes 1 though 8, missing volume 7. Antique ITALIAN books, 5 volumes. Inside reads, Della Istoria Ecclesiastica descrita da F. Giuseppe Agostino Orsi in Ferrara, MDCCLII, per Bernardino Pomatelli. Se vende in Venezia. Many antique books and bookends.